The R and the WE share the same changes for 2019, but the WE gets a little more, which we will get into a bit later. As far as shared changes, starting with the engine, updates include a new clutch cover and center cases, which have all been redesigned to accommodate a now-permanent electric starting system. 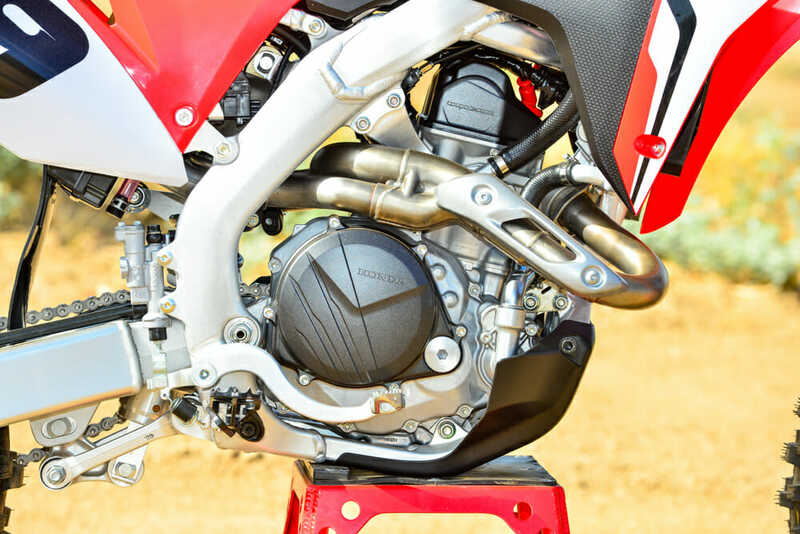 Since the CRF450R’s major redesign in 2017, you basically had the option of electric or manual starting. Now, there are no options, just electric starting, which we feel is the right choice. As a result, there is no longer a need for a place to install a kick-starter and because of that came a redesign of the clutch cover and engine cases. In the redesign, oil capacity was increased, as well, which makes the clutch much happier now. There is a new cylinder head design with changes near the exhaust ports to achieve improved exhaust efficiency, which Honda says contributes to increased power across the rev range. Honda also made many refinements to improve engine lubrication to increase efficiency and reliability. The two header pipes are larger in diameter now, and total tube length from the exhaust port to the muffler tip is up 98mm on the right and 187mm on the left, which Honda says improves overall engine performance. 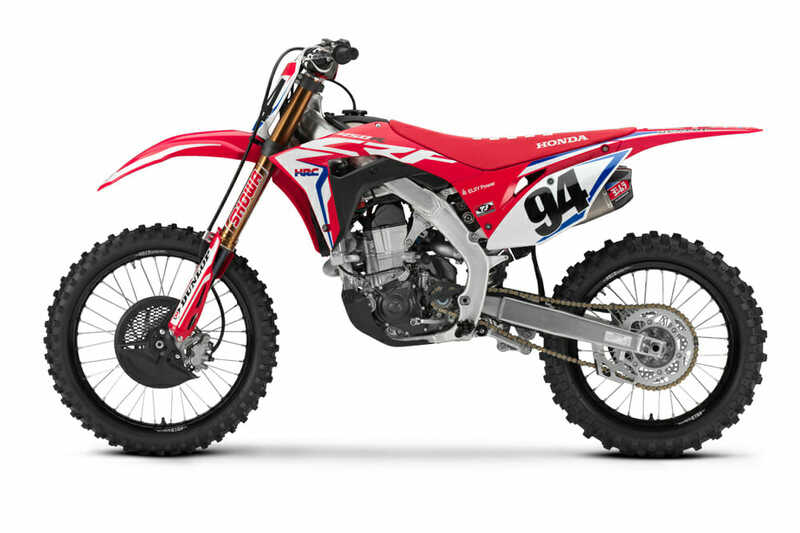 All dressed up in Ken Roczen’s clothes, the 2019 Honda CRF450RWE “Works Edition” sure is pretty. Like before, there is a three-level map switch on the handlebar, giving you the option of standard, mild or aggressive settings. You can toggle through them while on the bike, in gear and moving, but the engine must be idling. This year, there is a gear sensor, which means Honda engineers were able to fine-tune the power delivery for each gear. Launch control is new this year, too. You’d think it would be accessed through the map control switch on the left handlebar but you’d be wrong; it’s operated via the electric start button on the right handlebar. In the chassis department, the frame has been designed with more flex in mind to help tone down any harsh feeling that might be mistakenly blamed on the suspension, which, by the way, has new settings in both the shock and fork. The front brake has been updated as well, getting larger pistons and a higher quality brake hose. 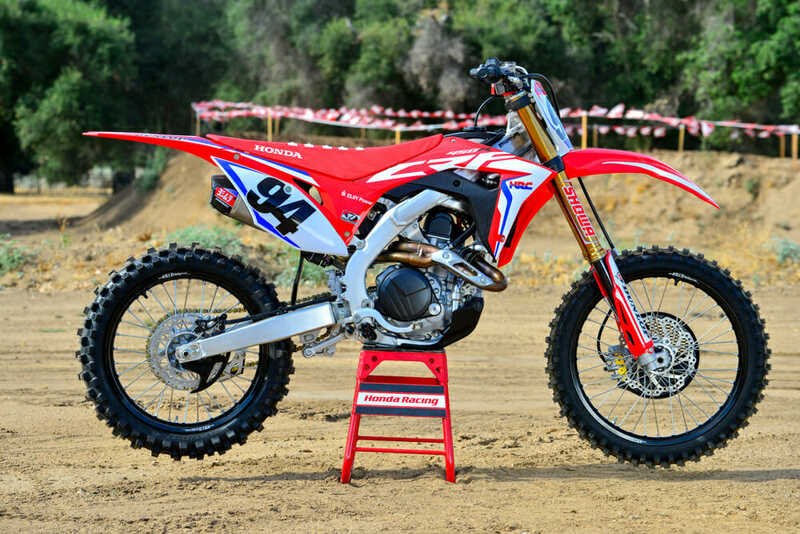 Honda got with the styling times and gave the new CR450R/WE black rims. Honda finally updated the handlebar department, too, giving it sturdier Renthal Fatbars and more bar-position/mounting adjustability. Before now, there were none, besides the usual rolling the bars fore or aft. Again, the Works Edition took on these same changes—and then some. Honda went a few steps further with the WE and gave it some performance enhancing upgrades, the same that you might do at home, like with the muffler. The WE comes with cool-looking slip-on titanium mufflers built by Yoshimura, far slicker than the standard’s mufflers. You’d probably do some head work, too, but Honda did that for you, as well. The WE’s cylinder head has been hand-ported and polished, and to go along with the ported head and the Yosh mufflers, Honda gave the WE “special” mapping. The WE also gets a higher-quality RK drive chain that is gold-colored, no doubt to handle the extra power and the higher demands of the pro racer. Rims are higher grade, as well. The LT-X D.I.D Dirt Stars rims on the WE are beefier than those fitted to the R model. A hand-ported head and Yoshimura mufflers give the WE a horsepower advantage for the standard. Suspension gets its own treatment, as well. The fork has been treated with Kashim hard-anodized coating internally and titanium nitride on the tubes to squelch stiction and smooth out fork action, and the shock’s shaft also gets a coating of titanium nitride for similar reasons. 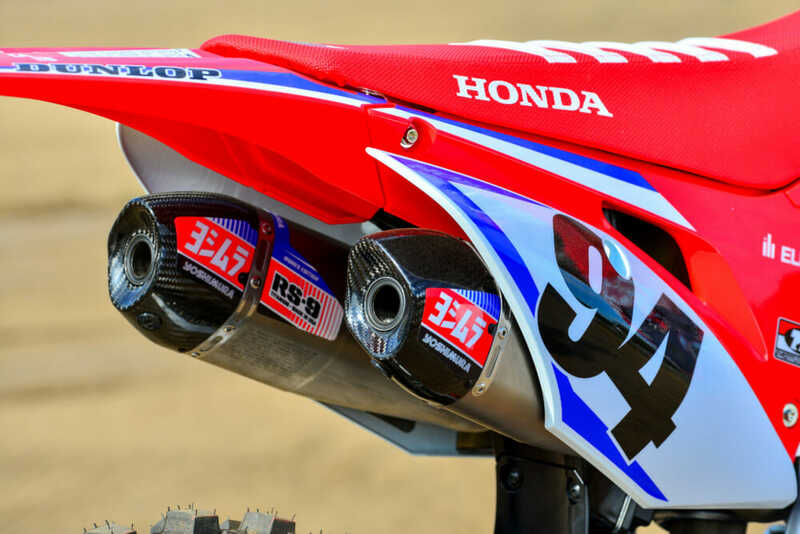 And, of course, the most obvious difference between the standard and the Works Edition is the WE’s factory race team-inspired Throttle Jockey graphics—which pays homage to Honda HRC’s Ken Roczen—and gripper seat cover. 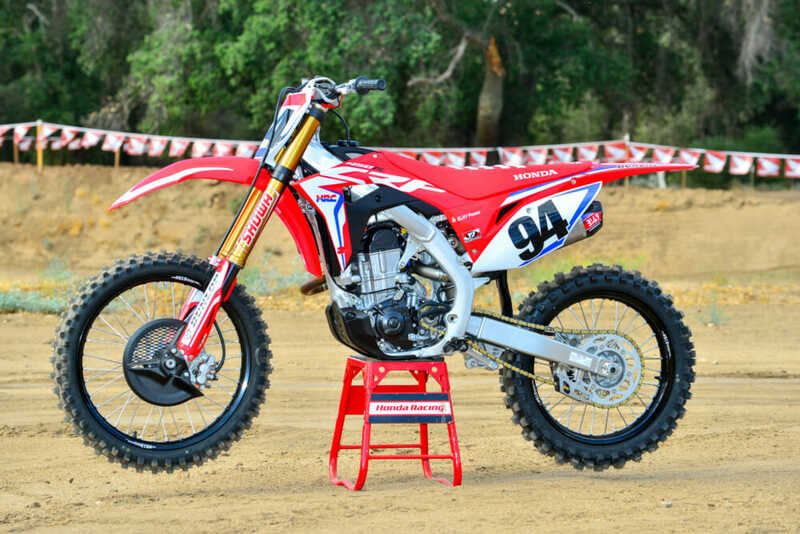 At $11,499, the WE sells for $2200 more than the CRF450R and is one of the most expensive motocrosser you can buy right now. Only 500 units will be available. The WE’s 49mm coil-spring fully adjustable forks feature special internal and external coatings like the factory bikes have. Throwing a leg over the WE for the first time, the difference in power is noticeable right off the bat between the CRF450R and WE—both in the power and suspension departments. 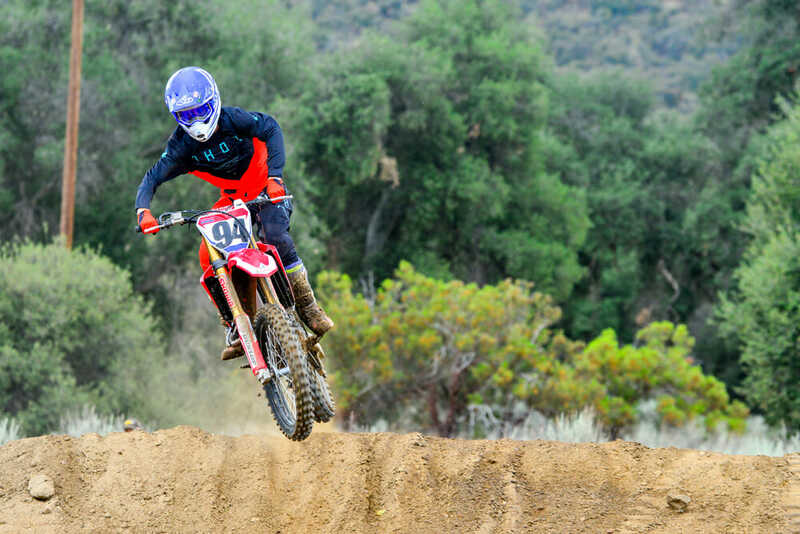 Our primary tester, a pro privateer racer who qualified for all three of the outdoor nationals that he signed up for last year, felt a noticeable gain in power with the WE, and was just plain impressed with the WE’s power output in general. 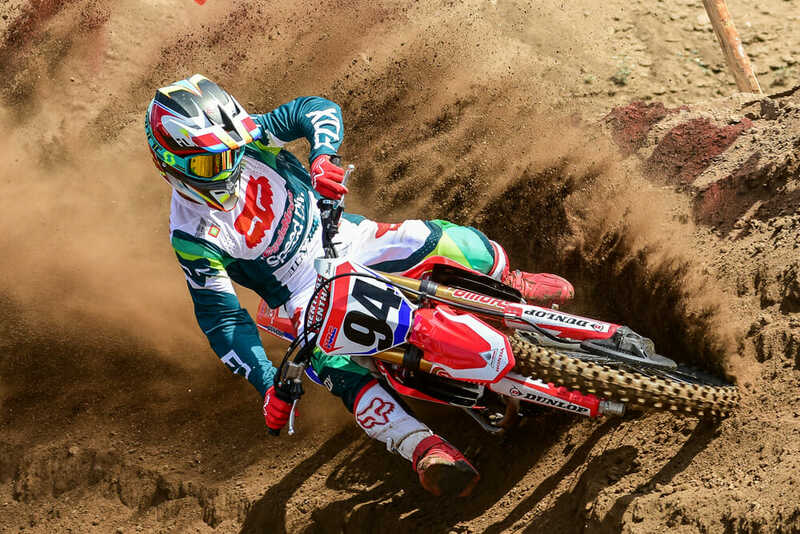 The clutch, which has been a weak link with the CRF450R in past years, seems to hold up better now that it is bathing in more oil, but, dang, we wish the WE had a hydraulic clutch like Roczen’s actual race bike. That would’ve really separated it from the R, but probably even more so with the price, too. The WE’s clutch is still a little on the stiff side and doesn’t have the best feel. Dang! Where’s the hydraulic clutch? He also praised the WE’s stronger brakes, more specifically the front brake, and the much-improved handlebars and adjustability that make big differences all for the better. 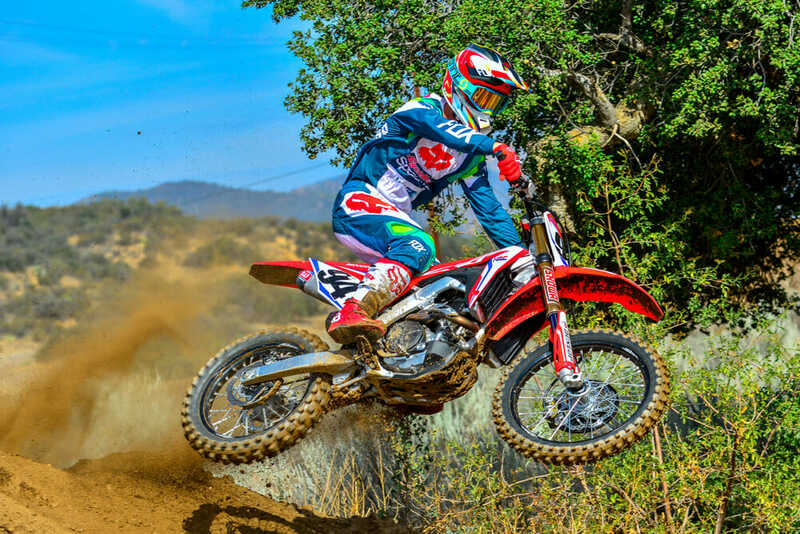 Some of the highlights over the standard CRF450R are the WE’s upgraded suspension, ported head and tougher rims. Like the CRF450R, the WE feels light at the controls and between your legs, even though it’s one of the heavier bikes in its class. 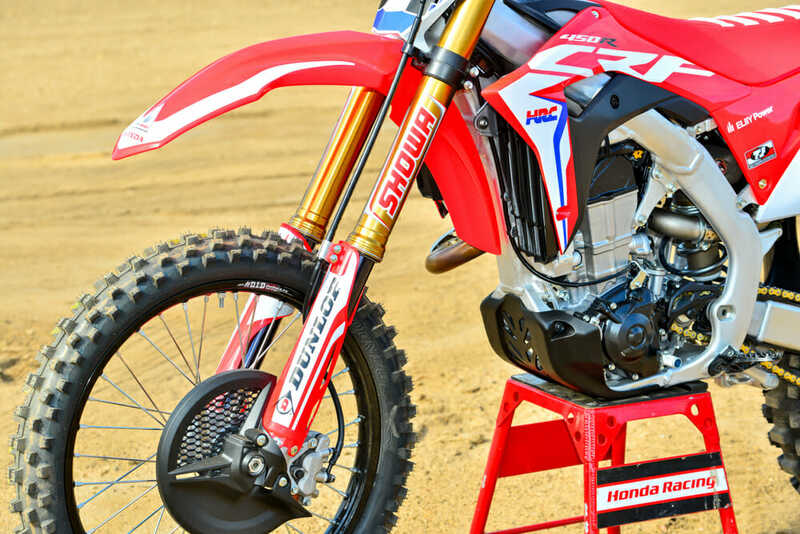 Our 2019 CRF450R test bike weighed 250 pounds with a full tank (1.66 gallons) of gas on our scale; Honda’s specs sheet show both bikes weigh an identical 247 pounds (curb). You can’t help but ogle over the WE’s looks. It’s beautiful. 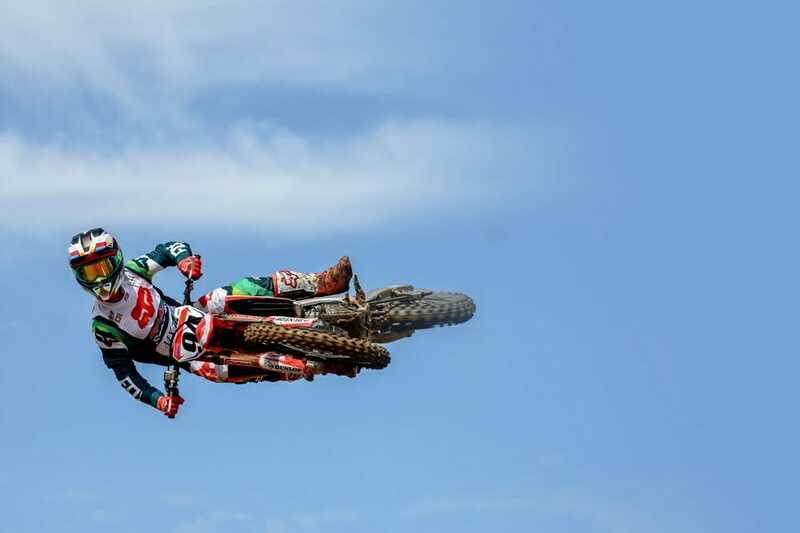 And it really does look like Roczen’s race bike; someone who saw the WE in the back of our test rider’s truck actually asked him if that was Roczen’s practice bike and if he was his tuner. The WE stays nice-looking, too. The in-mold graphics are durable and our test bike still looked nearly brand new after many days at the track. Unfortunately, our test bike ended up looking a little worse for wear when, on the day we handed it back to Honda at the track, one of our test riders, who quickly fell in love with the bike, got so confident on it that for a brief moment he thought he was Roczen—not good. Sorry Honda. But, hey, at least that was kind of backhanded way of the bike is real good. 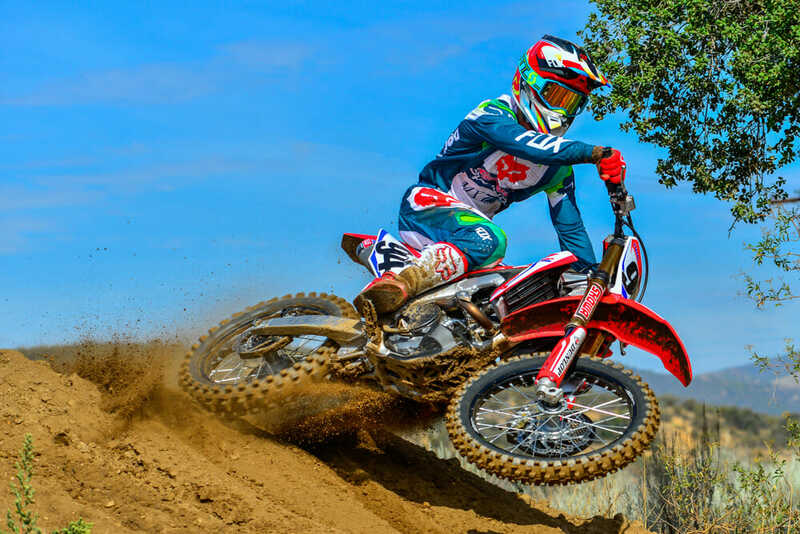 Yes, the CRF450RWE is an outstanding motorcycle in every way, except perhaps for the price. It’s not cheap, which leads us to the question—is it worth it? Well, when we first rode the bike late last year, our pro test rider was a little reluctant to say yes, feeling that if it was his bike, he’d still have the suspension breathed on for his personal needs, and would probably still have engine work done to it, too, so why shell out the extra money for the WE? Might as well go for the less-expensive standard model. But after spending more time on the WE, his feelings changed a bit. There is no weight difference between the standard and the WE, but, like the standard, the WE feels light and maneuverable both in the air and on the ground. FRONT TIRE: Dunlop Geomax MX3S 80/100-21 in. REAR TIRE: Dunlop Geomax MX3S 120/80-19 in. RAKE/TRAIL: 27°22’ / 4.6 in. WEIGHT (Claimed, curb): 247 lbs.